Tools of the trade #1 – Unity3D was posted on January 28th, 2014 at 7.36pm and is filed under 3D, Tools. This entry has one comment. You can follow any responses through the RSS 2.0 Feed. Get Well Soon! at the Made in Asia 2015! Come on in! It’s #indieDevHour! At GSM Productions, we like experimentations. If follows that, since our first little games all the way to Get Well Soon!, we have never ceased to try out new methods and new tools. But it would seem that, recently, our wild search has started to change into more of a “toolset consolidation”. This is why we have decided to write a small series of articles presenting our various tools. If you are a developer wanting to learn about the motivations of other devs or simply curious about the tools used to makes video games, tag along! The most fundamental choice for a game developer is about the “game engine”. These days, it is very uncommon for anyone to start coding a game from scratch. It might lead to total control about the code, the complexity of today’s computers as well as those of current games makes it much more complicated a task than it was before. 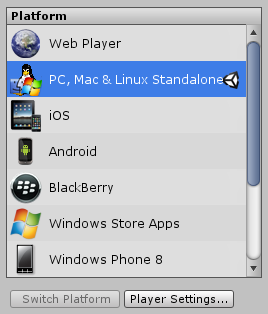 Between all the options available to us, we went with a very popular choice for independent developers : Unity 3D. 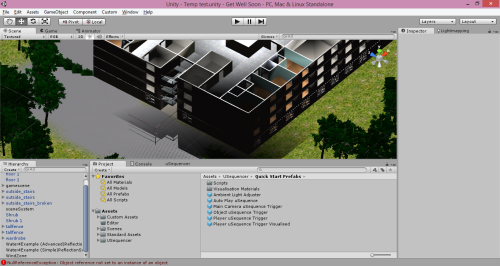 The Unity3D editor as we work on Get Well Soon! This extremely modular approach encourages the creation of reusable, self-contained components. It is a generally beneficial way of looking at things, but it is even better to have tools that enforces it. Since we adopted Unity3D, our development process has taken a new scope. The transition from a bunch of tools needing quite a bit of groundwork to get them working together to a platform integrating most steps, including direct import of 3D assets, images and other textures, changed quite a few things for us. We always stay on the lookout for new development tools, but at the present time, Unity3D is without a doubt the best environment for the type of games we are making. We may have taken our sweet time to get there, but boy, is it a great feeling!